California native Mark Lessman's musical experience covers a wide range of styles: from playing straight ahead jazz, to blues and rock and roll. Mark has developed a saxophone style which blends these and other creative influences into a full and mastered tone. 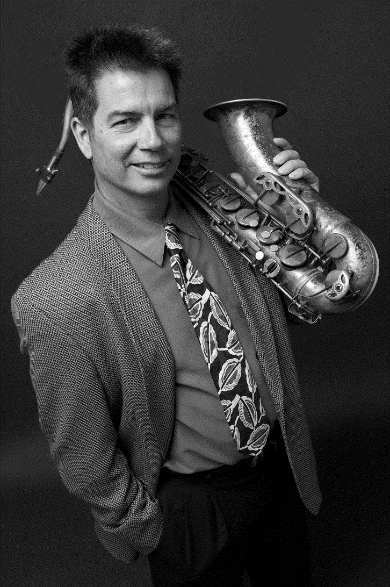 Mark first picked up the saxophone and flute at the age of fifteen and within a year was playing in the San Dieguito high school jazz band along with Tripp and Peter Sprague, John Leftwich, Kelly Jocoy and Rob Schneiderman. At seventeen Mark got his first full time club gig playing five nights a week with a variety band which was interrupted two years later by a move to the bay area to study with Dave Liebman. Mark also worked with jazz and latin groups in Santa Cruz. Upon returning to San Diego in 1981, Lessman assembled an acoustic latin jazz quintet that performed in San Diego jazz clubs. He then reunited with Jocoy, the Sprague's and Nathan East to join Rob Schneidermans jazz-fusion band Manzanita, recording the Pirate Lady album in 1984. Lessman then teamed up with saxoponist Johnny Almond (of Mark/Almond) to form the Lessman-Almond band. A rhythm & blues band that worked clubs and backed blues artist's while in town: Joe Turner, Jimmy Witherspoon, Big Mamma Thornton and others. From 1983 to 1986 mark worked as a sideman with various pop singers including Gina Eckstine (Billy's daughter) playing show rooms in Las Vegas, Reno and Tahoe, followed by a year with Private Domain, rock recording artist for A&M at the time. In 1986 he formed the Mark Lessman Band and took the thriving San Diego contemporary jazz scene by storm. Their debut album, 'More Or Less' (1990) received favorable reviews from the Los Angeles Times, L.A. Jazz Scene, and the Reader. The More Or Less c.d. has also been heard extensively on KIFM and Art Good's syndicated Jazz Trax show. The Mark Lessman Band has been musical host to three Carribean Jazz Trax cruises that added Tom Scott, Dan Siegal, Richard Elliot and Grant Geissman to the band. The band has shared concert stages with Patty Austin, Chick Corea, John McLaughlin, Sergio Mendes and others. Mark relocated back to the San Diego area Sept of 2001 after eight years in Chicago where he worked freelance for a host of Chicago bandleaders. What, you're not on my email list?